Are We Making Progress? Rental Licensing Recap. I am concerned about the pace with which the rental health and safety measure is progressing. Council member Jack Weiss, more than any other person in recent years, has advanced the debate on this important issue. Interest in the topic has been high over the last few months since he has been conducting the Planning Committee sessions and allowing the public to chime in. One of the largest interest groups, the students at WWU, has been especially active as the committee has witnessed. They, among renters, have the most to lose if there is no measure to clean up the horror show that is our rental situation. We need go no further than the rental surveys of several WWU organizations to realize that there are disasters waiting to happen. We have narrowly missed student deaths over the past two years in five fires in which over a dozen students have lost their housing. Associate Student leader Patrick Stickney spoke a note of caution earlier this year when he urged the Planning Committee to take action on an ordinance before May. After that time, students finish the trimester and, for all intents and purposes, do not return until late September. So the discussion on rental health and safety now continues, in effect, without the spokespersons for a group of 10,000 renters. This undermines the public process and deprives the city council and the city staff of valuable input. Meanwhile, the landlords and their paid lobbyists can continue unabated their efforts to influence. Having been a budget manager for the last 10 years or so of my federal career, I well understand the concerns of the Mayor and her attempts to put the city’s fiscal house in order by establishing and sticking by budget priorities. At the same time, the city ought to be able to contend with priority issues that gain importance even after budget decisions have been made. Surely such priority issues encompass threats to health and safety. I find it difficult to yield to calls for other items of a budgetary nature when rental health and safety has been on the radar for more than a decade and at a time when $1,500,000 of general fund money goes yearly to supporting a museum department. I love museums. I have visited them all over the world but I would trade any one of them for a human life or the well-being of tens of thousands of renters. I am also concerned that too much is being made of the “stats” provided by the Planning Department at the last Planning Ccommittee work session. [Click here to view the video at 92.40 on the counter] These were actually no stats at all. No specific numbers were given. Only a generalized characterization of the complaints over the last several years was made. Compounding this lack of specifics was the application of percentages to numbers that were not provided, such as how many of these complaints concerned rentals. The response was 15% but 15% of what? To draw any sort of conclusions from the presentation from Planning is not helpful in the least, especially since as Council member Weiss pointed out so clearly, there are already two surveys extant [here and here] that plainly arrive at the same conclusions which are that we have a serious problem with conditions of rentals in this town. All the talk of making it easier for students or renters to contact the city or an ombudsman or a campus entity still does not solve the issue of fear of retaliation, ignorance of dangerous conditions, or downright indifference (even indifferent renters deserve to be in a safe place and certainly their neighbors deserve not to be placed in danger). Similarly, building a program on an ineffective system that is already in place is problematic and only serves to delay the implementation of a demonstrably effective program undertaken in hundreds of cities. Complaint driven systems do not work (I again pointed the committee to the CDC report [click here] that actually studied the problem.). The endless iterations of discussion of this issue over the past decade have not changed any of the facts. We still are dealing with a recalcitrant landlord population that fights tooth and nail any suggestion of inspection of their self-professed well-cared-for rental units. They speak of their desire to see “bad landlords” shut down but offer no viable means to do so. Even their professional organizations whose representatives constantly assure us that their industry is safe but for the few “bad apples” have not sanctioned a single landlord or brought any “bad apple” to the attention of the city. Once and for all the rental industry is a business and businesses are regulated for the health and safety of the population that they serve and from whom they extract a significant amount of money. All businesses in town are subject to some sort of control from some statutory entity even if it is the location of the fire doors. 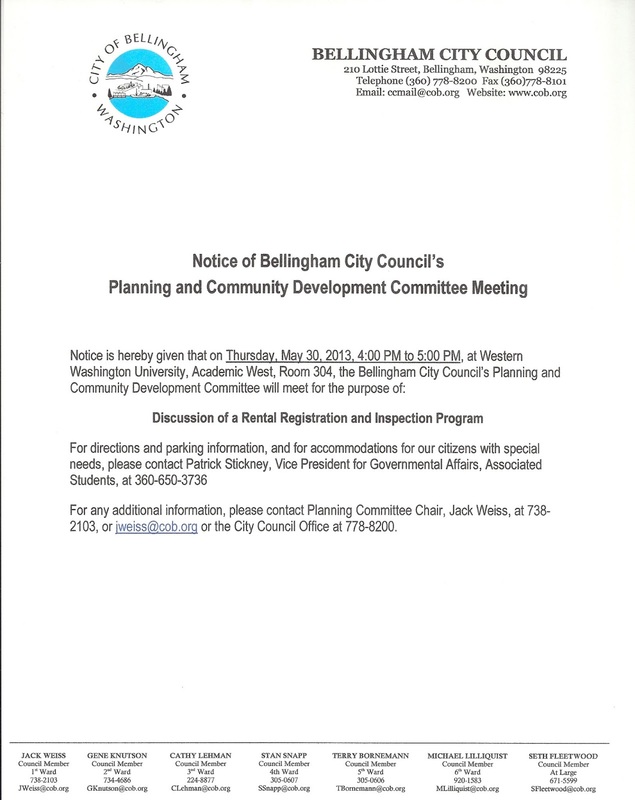 A mandatory inspection program that involves ALL Bellingham rentals solves the issues around reporting and education. Other cities do inspection regimes successfully and certainly we can do similarly with the approximately $400,000+ the registrations fees are likely to bring in. I invite the Planning Committee, the Mayor and the other members of the City Council to read my November 2010 email [reproduced below] to this same Planning Committee of which Council members Weiss and Lilliquist were members at the time. We continue to turn ‘round and ‘round the same mulberry bush which is that of a vigorous program of mandatory inspections. I cannot fathom the continued resistance to inspecting all properties especially if the fees will cover the cost. 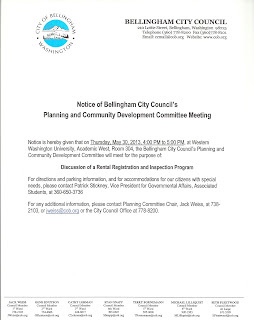 The Planning and Community Development Committee of the Bellingham City Council will hold a meeting on the campus of Western Washington University on the topic of rental licensing and inspections on May 30th. You can read the details by clicking on the flyer at left. WWU students are working diligently on many fronts to bring rental health and safety issues to the attention of the student body and to have the City Council pass an ordinance to register and inspect all rentals. Nearly 10,000 students live off-campus, mostly in rentals.